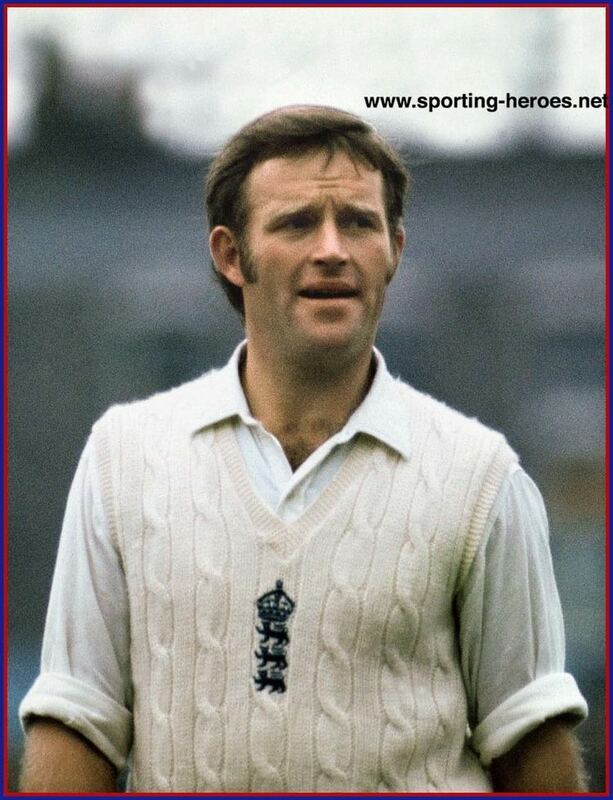 Dennis Leslie Amiss MBE (born 7 April 1943, Harborne, Birmingham, Warwickshire) was an English cricketer and cricket administrator. He played for both Warwickshire County Cricket Club and England. A right-handed batsman, Amiss was a stroke maker particularly through extra cover and midwicket – his two favourite areas to score runs. He was an accomplished batsman in all forms of the game. He averaged 42.86 in first-class, 35.06 in List-A, 46.30 in Tests and 47.72 in One Day Internationals. In first-class cricket he scored 102 centuries, and his England record amassed over 50 Tests ranks him with the best England has produced. After retiring as a player in 1987, he served Warwickshire as Chairman of the Cricket Committee, and he followed David Heath as chief executive from 1994 until 2006. In 1992 he was selected as an England selector. In November 2007 he became the deputy chairman of the England and Wales Cricket Board; in August 2011, described his role on the board as providing "cricketing knowledge and expertise [that] complemented Clarke’s business skills." Amiss suffered a serious back injury whilst playing football in his teenage years, which entailed him starting each day of his sporting life undergoing stretching routines to loosen up. Amiss made his Test debut for England in the fifth Test of the 1966 series with West Indies, and he proved an accomplished Test match batsman. He was one of the first batsmen to use a protective helmet. In scoring 3,612 Test runs, Amiss made eleven half-centuries and eleven centuries, including two double centuries against the West Indies. His highest Test match score, also his highest first-class score, was 262 not out against the West Indies in the 1973–74 Kingston Test, an innings that saved the Test match for England after they conceded a first innings lead of 230. The next highest score in Englands innings was 38. After being dropped by England in 1975, he made a successful return against the West Indies at The Oval in the final Test of 1976, although his 203 in the first innings did not prevent England losing the match. Amisss last Test came in 1977 when he was left out to make way for Geoff Boycotts return from self-imposed exile. His former Warwickshire teammate, Jack Bannister, stated "Dennis was always tinkering with his game, he was a bigger perfectionist than Colin Cowdrey". Amiss was also a handy One Day International batsman scoring 859 runs, including four centuries and one half-century, with a top score of 137 against India which is still Englands second highest individual score in the Cricket World Cup, behind the 158 scored by Andrew Strauss in 2011. He has the distinction of scoring the first ever One Day International century (103 in only the second One Day International in 1972) which is also the first instance of a debutant scoring a century in ODI. Amiss along with Keith Fletcher is also credited to have shared the first ever partnership of hundred runs in the same match. He ended with an ODI batting average of 47.72, which excepting those players to have played fewer than five times, remains the highest of any England batsman who has completed his career. The still-active Kevin Pietersen averaged over 50 throughout the first 60 matches of his ODI career up until September 2007, but that figure had fallen to under 41 by June 2011. Amiss played World Series Cricket in the late 1970s in Australia; during the 1978 World Series Cricket tournament, he became the first player to wear a batting helmet regularly.